I was internally dying for you to review this book, and here it is! I got this book mainly in response to the lack of code in 3D Math Primer (as good as that book was) which had some frustrating little gaps – I was frustrated at the smallest things like them not providing a calculation for the view transform. I obviously didn’t embrace that fact that you need to learn from multiple texts and not one. Nonetheless, I loved that this book provided code along the way which keeps practical coders like me motivated to keep reading to be frank. I did find some explanations somewhat complicated, especially on linear dependence, but it definitely covers a lot of stuff rather well. Keep up the great work! Loving these! Thanks for your support. 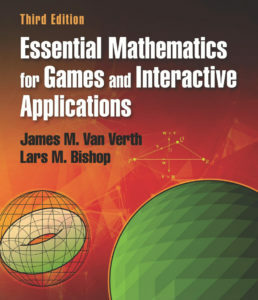 Yes, this is one of the better game math books on the market. The code samples are surprisingly complete and all the explanation is deep. What I find most interesting is that every book usually includes some tangential topics (in this case floating point representations, random numbers, some graphics programming, etc.) so each book is somewhat unique. This is great because you always can learn something new. Exactly. Every text is different. What I’m dealing with right now is the whole “authoritative text” mindset and I’ve skimmed through several of these books wondering which one to read cover to cover first, from order of complexity.